Milwaukee, Wisconsin ukulele and harmonica master Lil Rev returns to Hickory Ridge for an evening of great music. 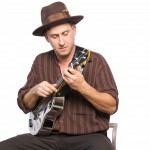 Though his first loves are for the ukulele and harmonica, Rev is actually a seasoned multi-instrumentalist equally adept with a flat-pick guitar, old-time banjo, or blues mandolin. Growing up in the shadows of American Motors, Briggs & Stratton, and A.O. Smith, the sights and sounds of Milwaukee’s industrial powerhouse in flux were an inspiration for his music, infusing it with strong esteem for the common man. His musical heroes include Pete Seeger, Woody Guthrie, Josh White, Sonny Terry, Cicso Houston and Leadbelly. His performances are stimulating, nostalgic and entertaining, while his enthusiasm for the subject matter is downright contagious.